For more than four thousand years, jade has figured in Chinese history, including its art history. It has become part of the development of civilization and religion because of its use for worship and burial rituals, and not merely as a material used for decoration. Jade in China has a higher spiritual position, way beyond the position of bronze, silver and gold. Jade for the Chinese, is associated with dignity, grace, morality and merit, and was once used only by high court officials and the nobility. The West had always associated the color green to jade, but in the East, the most valuable among all the colors of jade is white. People from all walks of life had been influenced by jade. Buddhism and Taoism have also influenced its use. From Chinese character designs, the craft of carving jade moved on to create luxurious and precious items. These were used by people to decorate their rooms and themselves, attaching meanings to jade pieces for eternity, beauty, elegance and loyalty. Jade was carved into different symbols depending on the person to whom it would be given and what they were intended to be used for. The underlying fact is that the hopes and intentions of the giver and the receiver are put into the creation of a jade item. Jade, which is called “yu” in Chinese is an ornamental stone, which came in a variety of uses – in relief sculpture, statues, figure carving and jewelry art. Most of the hard stone carving in China until today is still associated with jade. Carved jade objects are still highly prized, particularly in China, because it’s believed to represent immortality, longevity, beauty and purity. For the craftsmen, jade is valued for its various shades, its translucent colors and its glitter. From 4700 to 2900 BCE, nephrite or jadeite was the stone used for jade objects, but afterwards until later into the 18th century, nephrite was the favored type of jade used. Jadeite is similar to quartz in hardness but while nephrite is a bit softer, both of these jade varieties are steel-hard. Carving jade do not require metal tools. Jade is cut, fashioned and shaped traditionally with a soft tool and carborundum sand. It was only later that the method is replaced with better technology – using rotary tools attached with bits made of diamond. Due to the technical difficulties and rarity of processed items, jade became highly prized and were only worn and used by top officials in society and government. There were evidences found that jade had been carved in China since the Neolithic period but it was during the Bronze era in China under the Shang Dynasty that jade carving became very prominent, partly because of the availability of better tools. While the ancient artisans’ skill and patience in creating jade items declined, there were still pieces that exhibited incredible carving skills, such as the jade spear and jade blade with a handgrip made of bronze that are on display at the Beijing Palace Museum. Most of the jade pieces used during this period were for ritual and ceremonial purposes, with distinct features such as thinner outer edges, raised inner rims, concentric circles, birds, tigers and dragons. The carvers from the Zhou Dynasty were noted for working on very thin jade sheets for highly intricate relief sculpture fashioned into articles used in the wardrobe of many aristocrats. During the Han Dynasty, the tradition continued but the most notable were the suits made of jade that were worn by nobles such as Princess Dou Wan and Prince Liu Shen, fashioned from more than 2,000 jade plaques sewn with almost one kilogram of gold thread. Although jade at that time was mostly used by the royal imperial family members, it was considered an art form starting from the Song Dynasty, which peaked during the Ming Dynasty, together with the prized blue and white porcelain. 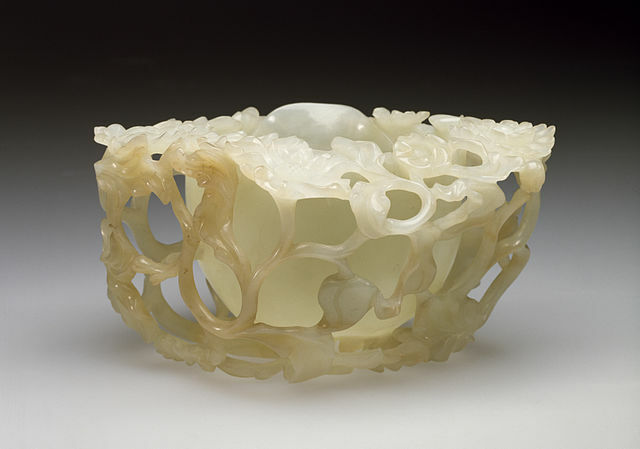 The Qing period saw the increased number of utensils carved from jade. 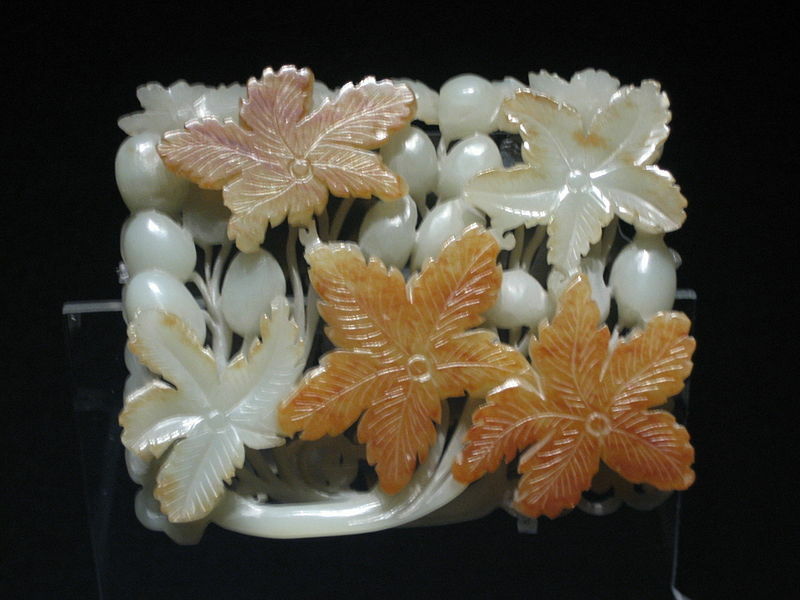 Through the years, jade carving symbolizes many things. It presented insights into life in Asia, their daily lives, their philosophical and religious beliefs as well as the precision and skill of artists from the Orient.